On September 26, 1918, the untested U.S. 79th Division was hurled into battle against German forces holding the high ground at Montfaucon. It was the opening of the Meuse-Argonne Offensive—the bloodiest campaign in American military history. Fittingly, the classical column that memorializes the AEF stands tall on the summit of Montfaucon Hill. 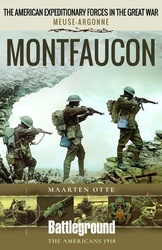 Military historian Maarten Otte looks at every facet of this watershed battle, from the Doughboys’ initial successes to the failure of the 79th to capture Montfaucon on the first day to how the ultimate loss of Montfaucon impacted the enemy. Finally, Otte offers an up-close look at the battlefield itself, including the magnificent memorial and the preserved defenses and ruins that surround it.